We are the leading manufacturer, wholesaler and exporter of Cooling Unit to our valuable clients. Our organization is highly appreciated in offering Indoor Cooling Unit to our clients. Ability to operate in excellent manner for years makes our range one of the best. It is widely acknowledged for its high efficiency, abrasion resistant finish, appealing designs and corrosion resistant coating. engineered with perfection. Indoor Cooling Unit is available in latest model series. Additionally, Indoor Cooling Unit offered by us could be installed quite easily. "Now we are introducing COLD ROOMS WITH SOLAR POWER"
Our organization is involved in production of Outdoor Cooling Unit to our clients. Operating in excellent manner for long time period. 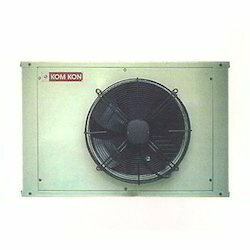 Outdoor Cooling Unit is provided with inbuilt protection mechanism and hi-tech parts. It has excellent cooling capacity and is available in technically advanced range. Apart from this, we are offering Outdoor Cooling Unit at reasonable price to our clients in order to cater to their requirements.